Playgrounds are aplenty in Singapore. You have your indoor playgrounds, outdoor playgrounds, wet outdoor playgrounds. For a tiny nation, it would not be difficult to find a playground 20 minutes from where you are. There is one type of playground that is still missing in our tiny red dot.... that is until Splash@ Kidz Amaze opens its doors. Welcome to Singapore first indoor Water Playground! Splash is a 24000 square feet 'Enchanted Deep Sea' themed water playground. It is one of the largest indoor playground in town. There are 2 main zones at Splash. The main play area will be the three story structure featuring eight decks and 5 slides. As impressive as it sounds, the slides are not as challenging. Not all slides are open to all kids. Kids below 120cm can ride on the green slide and the 2 mini blue slides at the back. While the bigger kids can enjoy the 2 faster and taller slides . Unlike other outdoor playgrounds we experienced, this limitation in height meant that probably kids 6 and above would enjoy this main playground. As part of the safety , there are crew in yellow tees that are around to supervise on the slides. 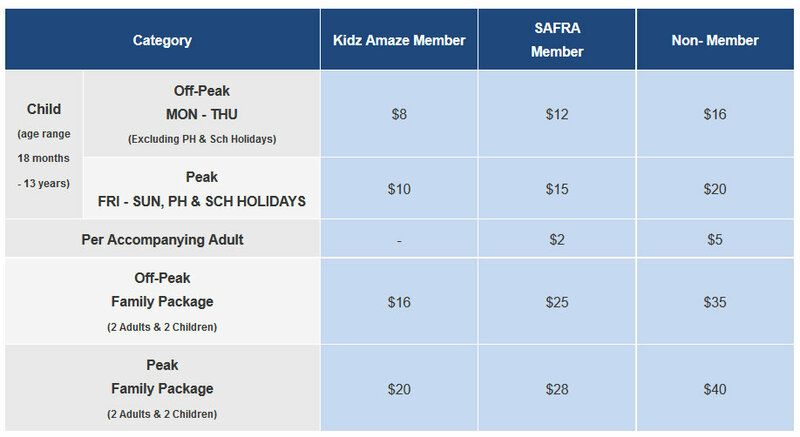 Nonetheless, at Splash @ Kidz Amaze , parents are highly encouraged to play with the kids . So adults, bring your swimwear along. It is almost a must that a water playground to include a water bucket for that big splash effect. Splash @ Kidz Amaze is no exception. In the evening, there is a special light effects on the roof. We highly recommend to go in the evening as the ever changing lights and background music provide a very soothing play experience. Toddlers are not left out of the equation. There is a relatively spacious toddler area that has a mix of water spouting structures in them. There is something special about waterplay as the boys found endless pleasure in 'shooting' each other with Water Guns. If you had played Virtual Aquarium games on the iPad, you would probably be familiar with this virtual play on the way. This is probably the only dry play area in the whole of the Water Playground. For those hosting parties, there are three theme rooms you can choose from. Have a party under the sea, swim with penguins or join the pirates at Pirates cave. No points for guessing which rooms the boys preferred. Sadly there are no cafes within the premises and no place for adults to sit if you do not have a room. So prepared to either stand or join the kids in the water while you are there. The good news is that toilets and changing room are located in the premises. If you need to store your barang barang, there are lockers of various sizes provided in the changing rooms. Charges are at $4 for the medium and $6 for the large one. For those with strollers, stroller parking are found within the park itself. Some safety points to take note while you are at the Water Playground. No footwear are allowed in the Water area. The pool area is 0.3m deep throughout the park. So leave those floats at home. Go slow round the water playground. It's rather slippery. Otherwise you might end up like L with a bruise due to a slip on wet floor. That said, since this is a water playground, parents should keep an eagle eye on the child. The park entry is for 18 months to 13 years. However we do feel that children age 10 and below would enjoy it more than the older ones. The pool will be close every third Monday of the month. Charges are as per above. Re-entry is not allowed. The Water Playground is open to public as well.Family package are available at an attractive rate. 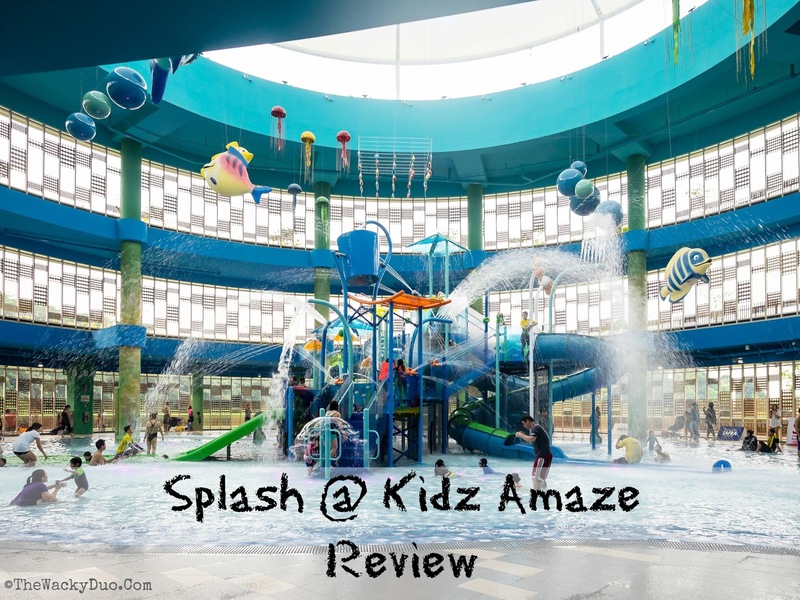 For a quick peek at Splash @ Kidz Amaze, check out the video above. Follow us on Youtube at The Wacky Duo youtube channel for more video reviews. We think Splash @ Kidz Amaze will be a great rainy or super sunny day alternative play area for families. As Singapore's only Water indoor playground, it will probably draw in huge crowds especially during weekends. We suggest a weekday visit if possible.